The location of the signing is heavy with symbolism: Aachen, located on Germany’s western borders with Belgium and the Netherlands, was founded by the Romans, making it part of the first pan-European state. 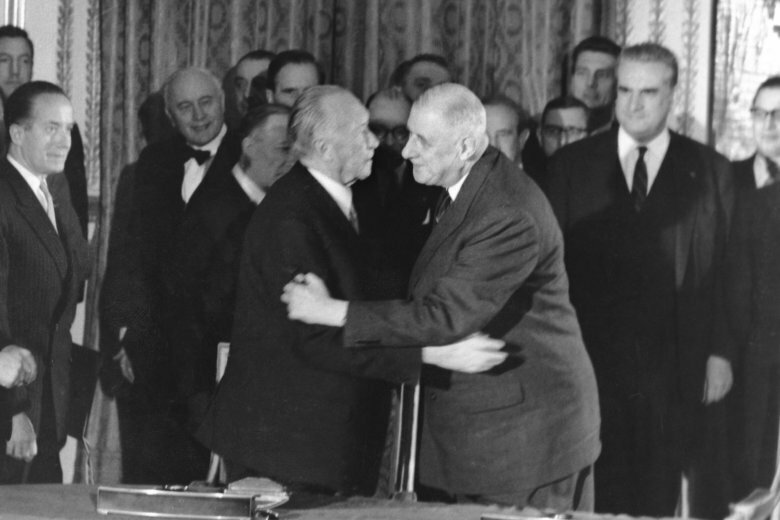 The Elysee Treaty of 1963 — signed 18 years after the end of World War II by French President Charles de Gaulle and West German Chancellor Konrad Adenauer — helped forge a partnership that’s become the engine of European integration, though one that hasn’t always run smoothly. The new treaty was first announced by Macron in September 2017 in a sweeping speech detailing his ambitions to revive Europe — still grappling with the shock of Britain’s referendum to leave the EU, and U.S. President Donald Trump’s persistent attacks on America’s long-time allies across the Atlantic. Macron’s office said the treaty is a “major symbol” aimed at showing the Franco-German motor is still going strong despite the difficult terrain in the EU, with Britain leaving the bloc and nationalism on the rise in several member states. While parts of the treaty deal with mundane issues along the two countries’ 450-kilometer (280-mile) border, Merkel said it’s also intended to help tackle global challenges such as climate change and international security. The accord is vague on many of the practical details, but one point that has raised eyebrows elsewhere in Europe is the call for France to support Germany’s bid for a permanent seat on the U.N. Security Council. Merkel’s spokesman, Steffen Seibert, rejected the idea that such bilateral arrangements between two countries — home to just 30 percent of the EU’s population — could irritate other member states. “Germany and France also and explicitly want the intensification of their relations in this treaty to service the project of European unification,” he told reporters Monday. A top French official, who spoke on condition of anonymity in accordance with the French presidency’s customary practice, acknowledged that France would prefer to “accelerate” changes in Europe and see the treaty as one more step toward broader reforms. Merkel, famous for her “step-by-step” approach to politics, is wary of the impact that a perceived surrender of German sovereignty might have on European and state elections later this year. For decades a bastion of political stability, Germany has seen the rise of a populist, far-right party in recent years that’s hostile to the idea of European integration. “Germany is being held up as the old enemy again by some,” said Daniela Schwarzer, director of the German Council on Foreign Relations. Eric Schweitzer, head of the Association of German Chambers of Industry and Commerce, said both countries’ economies could benefit. Germany is France’s biggest trading partner. And France is Germany’s second biggest export market.